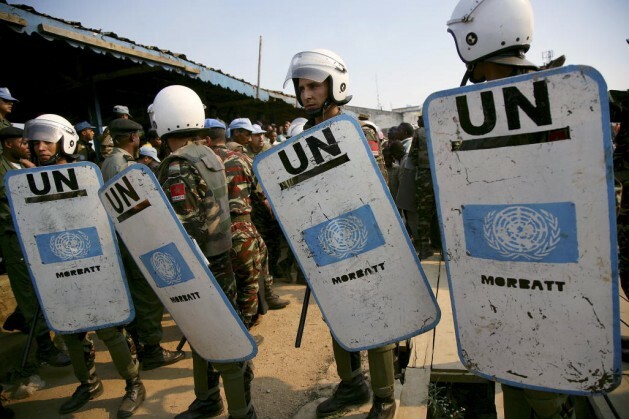 United Nations Organization Mission in the Democratic Republic of the Congo (MONUC) peacekeepers provide security at a trial. U.N. staffers have been killed in the country in recent years. Credit: UN Photo/Martine Perret. UNITED NATIONS, Jan 14 2015 (IPS) - The widespread field operations of the United Nations – primarily in conflict zones in Africa, Asia and the Middle East – continue to be some of the world’s deadliest. The hazards are so predictable that the United Nations – and its agencies – subtly encourage staffers to write their last will before leaving home. And working for the United Nations proved especially deadly in 2014 as its personnel “continued to be subject to deliberate attacks and exposed to hazardous environments”, according to the Staff Union’s Standing Committee for the Security and Independence of the International Civil Service. Asked if the United Nations was doing enough to protect its staff in these overseas operations, Barbara Tavora-Jainchill, president of the U.N. Staff Union, told IPS: “This is a tricky question, because in principle the responsibility for the protection belongs primarily to the host country, i.e., the country where the staff member is working/living”. “I think the most appropriate question is: should the U.N. send staff members to places where their security and safety cannot be guaranteed?” she asked. At least, 61 United Nations and associated personnel were killed in 2014, including 33 peacekeepers, 16 civilians, nine contractors and three consultants, compared to 58 in 2013, including 33 peacekeepers and 25 civilians and associated personnel. In 2012, 37 U.N. personnel, including 20 civilians and 17 peacekeepers, two of them police officers, were killed in the line of duty. The killings, some of them described as “deliberate”, took place in Afghanistan, Somalia, Mali, Cambodia, Pakistan, Democratic Republic of Congo, South Sudan, North Darfur, Central African Republic and Gaza. U.N. Secretary-General Ban Ki-moon has expressed serious concern over the continued killings of U.N. staffers in field operations. “I am appalled by the number of humanitarian workers and peacekeepers who have been deliberately targeted in the past year, while they were trying to help people in crisis,” he said, at a memorial ceremony last week to honour fallen staff members. In the past year, he said, U.N. staff members were killed while relaxing over dinner in a restaurant in Kabul while two colleagues were targeted after getting off a plane in Somalia. In a statement released Tuesday, the Staff Union Standing Committee said South Sudan was the country with the highest number of national staff members detained or abducted. In May, there were allegations that members of South Sudan’s security forces assaulted and illegally detained two staff members in separate incidents in Juba. In August, South Sudan’s National Security Service detained two national staff. And in October, eight armed men wearing plain clothes seized a World Food Programme staff member who was waiting in line for a flight from Malakal airport and drove him to an unknown location. to hostage-taking, kidnapping and abductions, the statement said. The worst incidents took place in the Golan Heights, where 44 Fijian peacekeepers were detained by armed opposition elements between 28 August and 11 September last year. Meanwhile, U.N. personnel were abducted in Yemen, the Sudan’s Darfur region, Pakistan and in South Sudan. An international contractor from India working for the U.N Mission in Darfur (UNAMID) was released on 12 June after 94 days of captivity. Asked about “hazard pay” for staffers in overseas operations, Tavora-Jainchill told IPS staff members do get hazard/danger pay depending on conditions of the individual duty station. United Nations staff members participate in a Pension Fund and there are provisions in that pension related to their death and the payment of pension/indemnities to their survivors, she added. The response was that those staff members are asked to consider “putting their business and paperwork in order”.